There used to be a way of looking at the production of things. You would hone your craft in the hopes that a person who was really good at hawking well-honed crafts would agree to do that for you. This worked out great because you got to continue working on your craft, and you got the revenue from it (well, some of it, at least). The downside was that you had to rely on the advice of the hawker regarding what would sell. In effect, the hawkers – because they were a proxy for the customers – became the honers’ only customer. What they felt they could sell became what could be sold. Let’s call this the “agent-system”. And as old as that system was it replaced a still older one in which you honed and you hawked. You made stuff, you sold stuff. You ran out of stuff to sell, you made more. You didn’t sell the stuff you made, you starved to death. The good news about this arrangement was that you had as many customers as you could reach out to and because people are notoriously different, there was always the possibility that someone would like what you were producing. Thanks to the world wide web it would seem that this is the system to which we have returned. Because perhaps the most revolutionary aspect of the internet was the way it took the means of distribution out of the hands of the few – the agents, the patrons, the whoever – and gave it back to the many. But in a way that made that old model infinitely more effective. Because the biggest problem that old model had was that in addition to being severely limited by simple time constraints (“Should I hone? Should I hawk? Can I do both at the same time?”), one was also severely limited by geography. If the people in your neck of the woods hated what you made, it didn’t matter that people a hundred miles away would pay top dollar for it. You’d never know. You couldn’t reach them. With the internet, of course, you can. And not only across miles, but also across time. Post something today and not only will people see it on the other side of the planet, but they also may see it five, ten or twenty years from now – at no additional cost to you. And in its way, Chris Anderson’s “The Long Tail” is the story of how and why this happened, and what it all means. Among the things that Anderson explores are two questions of particular interest for advertisers. First, what does this unlimited availability mean for consumers – how does it affect their expectation of the marketplace and how does it change want they actually want and need. And the second question? How does a marketplace in which the long tail of evergreen choices can fund their own availability (thus making less important the blockbuster successes which used to fund the whole enterprise) affect the choices companies are making? And which ones are responding most effectively, and what exactly are they doing? These are extremely valid and if they are not answered fully in “The Long Tail”, that’s probably as much because the book was published in 2006 as anything else. In 2006, iTunes was 3 years old, facebook was a year younger and Twitter just getting off the ground. But even that – like Anderson’s central thesis – serves to remind us that commerce is not static. It is evolving almost hourly. Your assumptions today will probably be inaccurate tomorrow. Your assumptions tomorrow will probably be inaccurate the day after that. It would be scary if we had the luxury of permitting ourselves to be afraid. And if it were not always thus. 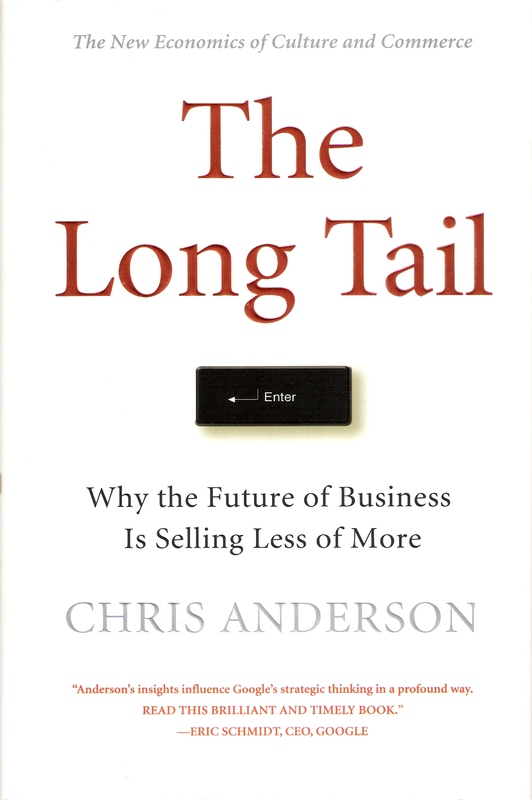 The Long Tail: Why the Future of Business is Selling Less of More by Chris Anderson was published by Hyperion on 07/11/06 – order it from Amazon here or from Barnes & Noble here – or pick it up at your local bookseller (find one here).